Dr. Erik F Hauck, MD is a Doctor primarily located in Springfield, OR, with another office in Raleigh, NC. His specialties include Neurological Surgery. He speaks English. Dr. Hauck has received 4 awards. 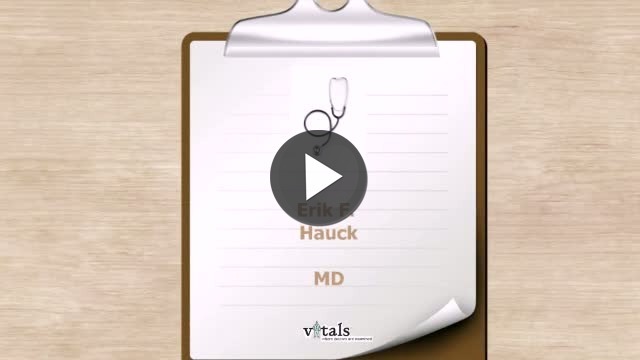 The overall average patient rating of Dr. Erik F Hauck is Excellent. Dr. Erik F Hauck has been rated by 22 patients. From those 22 patients 9 of those left a comment along with their rating. The overall rating for Dr. Erik F Hauck is 4.6 of 5.0 stars. Endovascular neurosurgeon Erik Hauck, MD, PhD, is a key member of the Sacred Heart stroke team, specializing in treating stroke and brain aneurysm patients. He is currently the only sub-specialist of his kind in this region of the state, and his unique ability to perform complex procedures in the brain allows Sacred Heart to care for stroke and brain aneurysm patients in a whole new way. A native of Germany, Dr. Hauck received his medical education from Westfalian Wilhelms University, Munster, Germany. He completed his residency in Neurological Surgery at the University of Texas, Houston, and at MD Anderson Cancer Center. Dr. Hauck completed fellowships in Cerebrovascular Neurosurgery at the University of Texas, Southwestern Medical Center, Dallas, and in Endovascular Neurosurgery at State University of New York, Buffalo. When he isn't caring for patients or conducting clinical research, Dr. Hauck enjoys outdoor sports and classical piano. He lives in Eugene with his wife and three children. Take a minute to learn about Dr. Erik F Hauck, MD - Neurological Surgery in Springfield, OR, in this video.